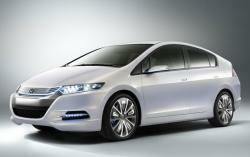 Honda to Launch New Hybrid Model! Honda has just announced that it will be launching a new low-cost hybrid in 2009 to go head-to-head with the Toyota Prius. Details here. If it's low-cost, it will not go head to head with the very expensive Prius. cool looking~ but it looks expensive thou...looks like it has a camera there on each side, instead of conventional 'side mirrors'...cool... and cheap??? That is a hint at just how ugly cars can get. Did they hire the Aztek designers away from floundering GM? What's with that? Either make it a wagon, or make it a hatchback. Or a coupé. Why an Aztek clone/super-sized CR-X? My my that IS ugly, and apes the Prius a little too closely. The rear headroom looks non-existent, just like a Prius. And what's with the popped airbag? Did they hit a Canadian pothole in Mojave? Honda will reveal a concept version of its new small hybrid vehicle, to be named Insight, at the 2008 Paris International Auto Show, October 2, the company announced today. The new Insight Concept shares styling cues with the Honda FCX Clarity fuel cell vehicle and will provide an early look at the highly-anticipated five-passenger hybrid vehicle.Going on sale in the U.S. next spring, the all-new purpose-built Insight will come to market at a price significantly below hybrids available today. From this unique position in the marketplace, the Insight will advance the affordability and accessibility of hybrid technology to a new generation of buyers. I'm getting tired of waiting for new cool vehicles to come out... it's so bloody slow in North America. I like that in Europe, the new model launch dates are very specific, usually just before the Paris Auto Salon. They should have just put Toyota badges on it and driven it around without all the masking and veiling, no-one would have known the difference. *yawn*Well if they can bring a cheap hybrid to market more power to them but it'd be nice if looked like the first thing shown in this thread. Very curious about the mechanical setup of this economical/scaled down Hybrid system. Hopefully the comprimise for the lower price isn't a hurt in fuel consumption (ie, less economical than a Prius or Civic Hybrid). It is exciting to see a new player. It's be hard for it to be less economical than the Civic Hybrid, which - despite the TC overall rating of 4.5 L/100 km, have typical lifetime averages of 5.65 L/100 km. If it was much worse, it'd be into regular car territory! Wow that's rough. I can get within 0.5L/100km of that with my truck without really having to try that hard. And I can better that number if I really put my mind to it. It's simpler and cheaper-built than the Prius, but slightly less efficient. The big question is whether Toyota North America will live up to the rumor that they plan to price-match the 2010 Prius to the Insight. What the insight has as an advantage right now is price (and marginally cleaner looks, IMHO), along with more driver involvement. Without the price advantage it will be tough to sell a smaller, cheaper-looking, less-efficient Prius clone. 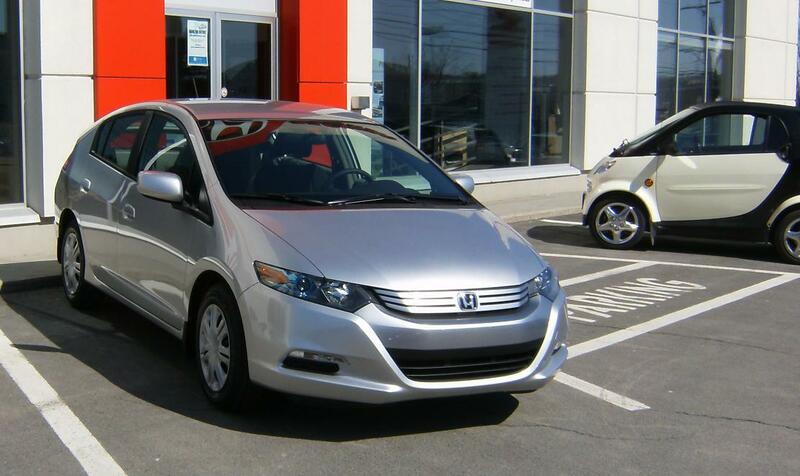 If toyota Price matches the 2010 to the insight... that would represent a drop of about $5k. That's an awful lot. I doubt they can do that, considering i thought they were already losing money on the prius. That being said, i want to go take a good look at the new little guy on the block. Some complains are that it is loud on the highway. If that's true, then no thanks. I spend to much time on the highway, and my Cobalt is near silent.